You might not expect bathroom decor to boggle your mind - but sometimes, everything needs to get a little crazy. Even toilet paper. Here are some of the strangest bathroom accessories found on the web. Most people probably don't put a lot of thought into their toilet paper, but apparently some individuals aren't happy unless they can clean themselves with something amusing. For instance, Trend Hunter's list of "Bizarre and Beautiful" bathroom decor items features a toilet paper roll meant to resemble a series of paint-by-numbers drawings. Meanwhile, Designs Magazine features a similar compilation of bathroom decor oddities, including glow in the dark toilet paper. Why a person would ever need glow in the dark toilet paper is anyone's guess. On a more practical level, there's also such a thing as toilet paper with a different Sudoku puzzle on each sheet. For those whose taste is decor leans toward the morbid side, there's also a toilet paper holder meant to resemble the Grim Reaper, presenting you with a roll inscribed with black skulls. 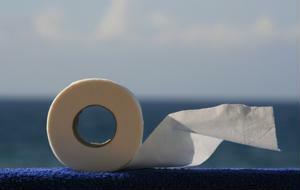 The yellow tape often used to wall-off crime scenes also inspired a brand of specialty toilet paper possibly marketed to fans of crime drama television shows. It goes to show how bathroom decor can be educational - Designs Magazine displays a shower curtain that shows the entire Periodic Table for science enthusiasts who want to refresh their knowledge of the elements while they wash their hair in the morning. Another shower curtain on Trend Hunter depicts an elaborate city skyline during a lightning storm. For fans of horror films, there's a curtain showing the silhouette of Norman Bates, so the user can imagine he or she is being stalked just like Lila Crane in Alfred Hitchcock's 1960 landmark film, Psycho. In what might be the strangest bathroom decor tidbit of all, several news providers have reported that former American Idol judge Jennifer Lopez flatly refuses to use any toilet seat aside from her custom-made, jewel encrusted toilet seat that may or may not have been a gift from Ben Affleck sometime during their ill-fated romantic relationship about 10 years ago. Either Lopez is pathologically particular about her lavatory routine, or one celebrity reporter has an impressive imagination.